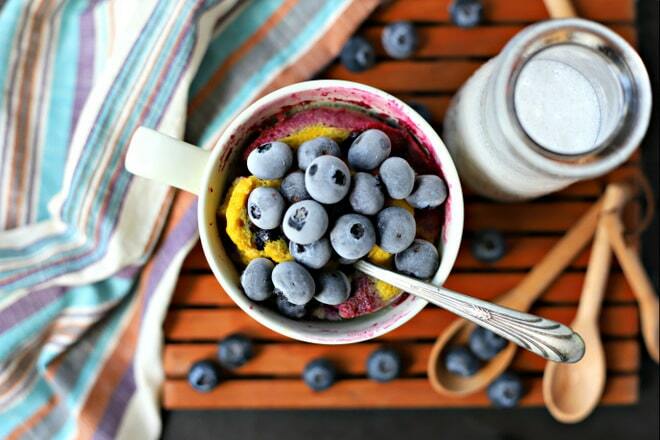 This Single Serving Blueberry Muffin Mug Cake is the healthy answer to your sweet craving! Made with Whole Food ingredients plus a Low Carb option! Recipe created in partnership with Bob’s Red Mill. Back to School has been such a HUGE adjustment this year. Both of my kids started new schools (hello move across the country and change everything about your life). We have tried really hard to present the move as something positive and as a big adventure so the kids seem to be adjusting well for the most part – kids are pretty resilient and both of our guys are super social and friendly so that is all good. One negative is that the school day is longer than what we were used to and our school commute has increased. That means SUPER HUNGRY kids after school. One of my favorite quick warm snacks for the boys are mug cakes. They can help make them, it feels like a major treat and because I make my mug cakes with a whole farm egg, they are getting a protein boost! I partnered with Bob’s Red Mill to create this Gluten Free Blueberry Muffin Mug Cake. You guys – it’s SO GOOD. The texture is perfect and the kids really feel like they are eating a blueberry muffin. The version I give to the kids has maple syrup in it but I’ve also tested a Low Carb version for all of you avoiding any added natural sweeteners. That way you can make one for yourself and sit and talk with the kids before the craziness of making dinner / packing lunches / doing homework / sports practice / etc. starts. This Single Serving Blueberry Muffin Mug Cake is the healthy answer to your sweet craving! Made with Whole Food ingredients plus a Low Carb option! Combine coconut flour, baking powder and sea salt in a microwave safe mug. Whisk or mix with a fork until all clumps are gone. Add maple syrup, melted coconut oil, non-dairy milk and vanilla extract. Whisk or beat until smooth. Add egg and beat until completely smooth and aerated - about 30 seconds. Stir in 1 T of the blueberries and placing remaining T of blueberries on top of batter. Microwave for 2 minutes (see NOTES for variances on microwave cook times, mugs and dietary substitutions). Remove and allow to cool for 30 seonds. Serve and ENJOY! Omit maple syrup and use 4 drops of Monkfruit or Stevia sweetener. Increase coconut oil to 1.5 T.
Bob's Red Mill Baking Powder is Gluten Free but does have cornstarch in it so if you are avoiding corn for Paleo / Keto / Plant Paradox, omit. The muffin will be a bit less flat but still just as delicious!! Frozen blueberries can be substituted for fresh but do not thaw them first, use directly from the freezer. Microwave ovens vary and can significantly impact the cooking time. Start slow and keep adding time to figure out the perfect formula for your microwave. Please note that the nutrition info provided is for the exact recipe listed (includes maple syrup, baking powder, etc.). I just made this. It’s ok, tastes like an omelette with blueberries. I would cut the egg in half next time. Can the mix (without the blueberries) be made prior, can it sit overnight in the fridge? Hi Maria, I wouldn’t recommend it. The coconut flour will likely absorb most of the liquid and ruin the texture. I would recommend coming dry ingredients and then all wet ingredients (except EGG) and then just combining with beaten egg when you are ready! Yum! I’ve made these the past 2 days. I’m sure I will be making this on a regular basis! Love!! Thanks for taking the time to comment and let me know Nicole! Just made 2. They WERE delicious!! I love easy recipes like this! Adding to my list of must makes, so tasty and yummy! Perfect!! You will love it! My kids have had this every single day this week after school! Mug cakes are my jam! I cannot wait to check this out! I love how easy this is, so fun! Love this idea! Need to make this ASAP! Hope you love it Jamielyn! This looks so good! The best part about a mug cake is that it’s made for one so no reason to share, haha! I love how easy this is! Perfect for when you’re craving something sweet. When do you place the blueberries into the mixture? With the dry ingredients on sprinkle on top before the microwave?